This page focuses on the mandrake plant’s habitus and requirements. The legends and folklore are discussed elsewhere. 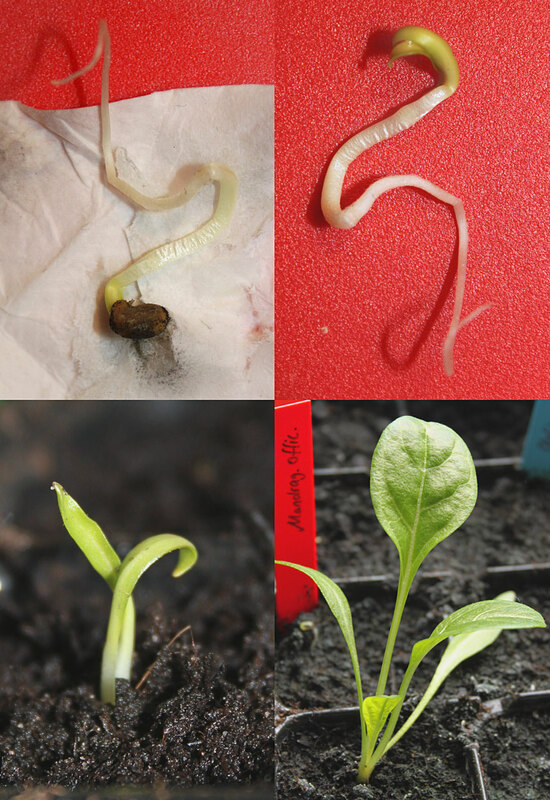 Propagation by seed: cold germinator. Sow in late summer and wait for the next spring. Or stratify the seeds in wet paper towels, which are kept in the fridge for a few weeks. Check frequently if you discover any mold. Exchange the paper towels every so often. Mold is a bad sign, but this does not mean the seeds are also rotten inside. Just clean the seed and replace the paper towel. When you take them out of the fridge, you can either continue to keep the seeds in paper towels until they germinate, or you sow them into soil. The seeds germinate stimulated by the change of temperature. The soil can be a mix of seeding compost from the garden center and crushed granite or use perlite. It’s important the soil is lose and has a good drainage. Keep moist and do not allow seeds or seedlings to fall dry, but avoid water- logging. Some people also cultivate mandrake in hydroculture. If you have experience with hydroponics and mandrake, please share it in the comments. When the mandrake seed has germinated, care for the young plantlet, by keeping the soil moist (not soppy). The young plant will show only 3-4 leaves in the beginning and concentrate its energy into root growth. The first 2 leaves soon start fading. I wait with transplanting, until the root starts to permeate the bottom of the tray. That’s when I move it to a larger pot. The best containers are those used for roses and other plants that develop long roots. Some also grow their mandrake in tubes! If you have the option, plant the mandrake outdoors in the bed. Then you will see fruits (which seldom happens, if they are planted in pots.) Manure once a year, with compost soil. If you live further north, with harsh winters, the plants may need winter protection or overwintering indoors. In that case it is better to grow mandrake in containers, so you can move them indoors during the winter-time. Another benefit is that the plant is better protected from slugs. The downside with growing mandrake in a container is that it may not grow as big and healthy. My mandrake planted outdoors in the bed has already survived 2 winters and is doing fine. The biggest problem are snails, that graze the leaves as if they were salad. When growing in a container, it is crucial to use a very loose (or should I say fluffy) substrate. When I order mandrake from garden centers, they always come in super-fluffy peat soil. Even though they are used to other soil in nature, I would recommend using a mix of peat, normal garden soil, very little loam and perlite. It is also recommended to cover the top layer with gravel or perlite, which provides even moistness and prevents moldy build up of damp underneath the leaves. The leaves react especially sensitive to water logging and are prone to mildew. Water the soil around the plant, but not the leaves. Nutrients: seeds and seedlings are nurtured by the seed itself and do not require additional nutrients! Start fertilizing only when the plants are already a few weeks old. For mandrake planted to the ground, I use compost manure once a year. The mandrakes planted in pots may need to be treated with aphid control sticks, which also contain nutrients. Then they do not need any additional fertilizer. Hormones: Germination and root growth can be stimulated with hormones such as GA3. If you have experience with plant growth hormones, please share them in the comments.